The Lermond Company is proud to be a 2016-2017 corporate sponsor of the Women in Flavor and Fragrance Commerce, Inc. The Lermond Company now offers organic essential oils and hydrosols. We are certified by Oregon Tilth as a handler of organic products under the USDA National Organic Program. The Lermond Company has been certified as a women's business enterprise by the Women’s Business Enterprise National Council (WBENC). The Lermond Company proudly announces its﻿ partnership as the exclusive North American distributor for Indukern Flavour & Fragrance Ingredients of Barcelona, Spain. Click here for the announcement. 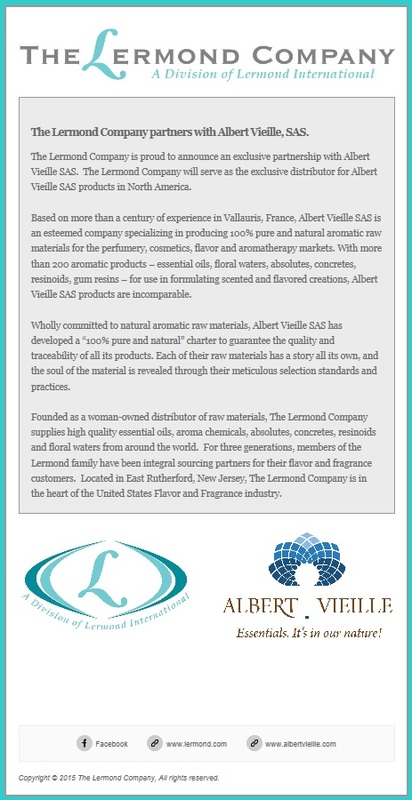 ﻿The Lermond Company proudly announces its partnership as the exclusive North American distributor for Albert Vieille SAS of Vallauris, France. Click here for the announcement.